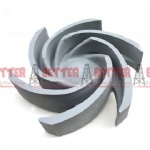 On the impeller by the introduced Patented Design of a Chinese specialist engineer. To use the improved impeller, the mud in the stuffing box will be relative flowing, so that the temperature caused by the seal surface frication will be lower, and the light sand partial could be took away, and then the mechanical seal’s life will be prolonged. And the inside pressure chances will reduce the mud loss when mechanical seal is out of work. 3. YYY－the metric diameter of impeller, therefore 12” is code as 305mm, 11” is coded as 280mm.